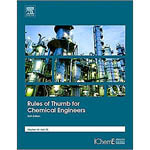 Rules of Thumb for Chemical Engineers, Sixth Edition, is the most complete guide for chemical and process engineers who need reliable and authoritative solutions to on-the-job problems. The text is comprehensively revised and updated with new data and formulas. The book helps solve process design problems quickly, accurately and safely, with hundreds of common sense techniques, shortcuts and calculations. Its concise sections detail the steps needed to answer critical design questions and challenges. The book discusses physical properties for proprietary materials, pharmaceutical and biopharmaceutical sector heuristics, process design, closed-loop heat transfer systems, heat exchangers, packed columns and structured packings. This book will help you: save time you no longer have to spend on theory or derivations; improve accuracy by exploiting well tested and accepted methods culled from industry experts; and save money by reducing reliance on consultants. The book brings together solutions, information and work-arounds from engineers in the process industry. 科大文化事業股份有限公司 SCI-TECH Publishing Company Ltd. Copyright © 2004 SCI-TECH All Rights Reserved.